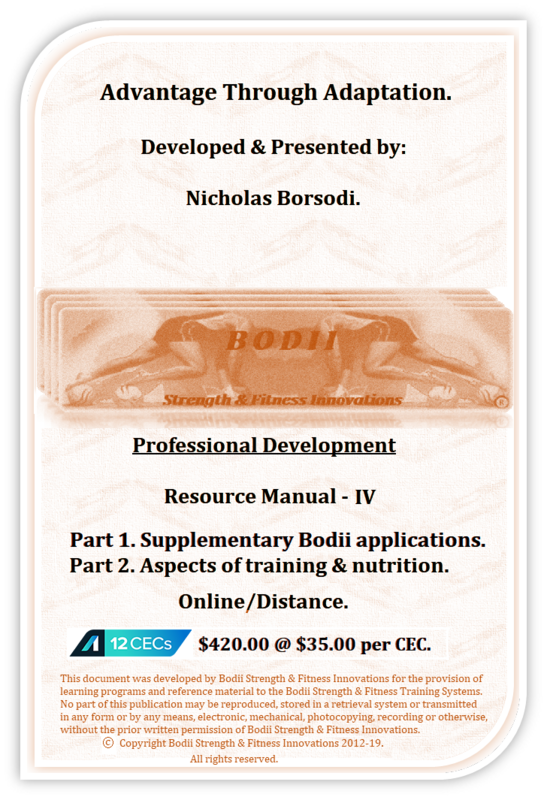 The final offering in this series of Bodii programs, where the exciting proprioceptive principles from previous programs are given their most intense and inclusive adaptation possibilities. While it is accepted that the concepts and techniques put on display in these programs are challenging to the extreme, it is recognised that safety is still of paramount importance. Once participants/students have explored these programs, they will come to realise how the inclusiveness and co-ordination of major body systems/structures best achieves this purpose, yet maximises the bodies propensity towards adaptation. Includes a bonus examination of the leading factors that assist in the individuals ability to achieve all they desire from their training and the chemistry of nutrition. Dumbbell 25cm core-ball chest press. Seated 25cm core-ball kettlebell leg extensions. Prone bridge core-ball leg curls. Core-ball compression & triceps extension. Core-ball compression & biceps curl. Core-ball compression & leg extensions. Core-ball compression & cable machine leg curls. 3. Full body-body weight/harness training. Body weight/harness overhead triceps extension. Body weight/harness and 25cm core-ball biceps curl. Body weight/harness front raises on two core-balls. Body weight/harness prone bridge leg curls. Body weight/harness reverse Lat fly. Body weight/harness calf raise/hamstrings stretch. Core-ball on core-ball flexibility/mobility moves. Core-ball on core-ball triceps kickback. Core-ball on core-ball mountain climbers. Core-ball on core-ball standard bridge hover. Core-ball on core-ball seated biceps curl. Core-ball on core-ball triceps press. 5. Across the body cable & alternate side resistance. Cable & dumbbell shoulder press. Cable & dumbbell overhead triceps extension. Cable & kettlebell leg extension. 6. Demonstrations involving conflicting points of resistance and load. Biceps curl @ conflicting points. Triceps overhead core-ball extension @ conflicting points. Core-ball hip abduction @ conflicting points. Core-ball cable cross-over fly @ conflicting points. Left lateral profile upright row. Bodii simulations of common sports actions. Random variations to common strength & machine exercises. 1. Barbell press across a standard gym bench. 2. Single arm cable/pulley machine press. 3. Cable/pulley machine core-ball triceps extension & hip adduction. 4. Barbell (feet adducted) behind the back row seated on 25cm core-ball. 6. Machine seated leg press. 7. Single leg barbell calf raise lunge. 9. Kettlebell & core-ball chin-ups. 10. Chin-up with 15cm core-ball variation II. 11. Core-ball hover & cable cross-over leg curl and hamstrings extend. 12. Chin-up & harness cable cross-over leg curls. 13. Hanging harness leg extension & core-ball compress/stretch. 14. Single leg diagonal machine curl with core-ball. 15. Bodii smith machine 2 x core-ball squats. 16. Two core-ball dip & leg extension. 17. Inverted reverse leg press. 18. Leg press at 45cm core-ball. 19. Seated barbell/cable machine chest press. 20. Dumbbell seated chest fly. 22. Cable machine/barbell seated core-ball leg press. 24. Standard core-ball bridge Lat pulldowns. 25. Supine cable machine/barbell leg curls. 26. Single arm oblique core-ball hover & compress/stretch. 28. Standing cable hamstrings move. 29. Standing cable quadriceps/hip flexor move. 30. Standing cable gluteal move. What is the correct daily intake of protein? Do not avoid complex carbohydrates. a) Be aware of, and control serving sizes. b) Serve your meals on smaller, entree sized plates. c) Know when to stop eating. d) Do not look to food for comfort. e) Never go back for seconds. f) Adapting fast food options. 3. Never go without breakfast. 4. Plan meals & space them evenly. 5. Eat more vegetables, fresh fruit and wholegrain cereals/breads. b) Preserving nutrient quality and safety. 8. Pre-exercise, workout, event meals & sports drinks. 10. Learn to adapt recipes. Conclusion to the Bodii Programs.